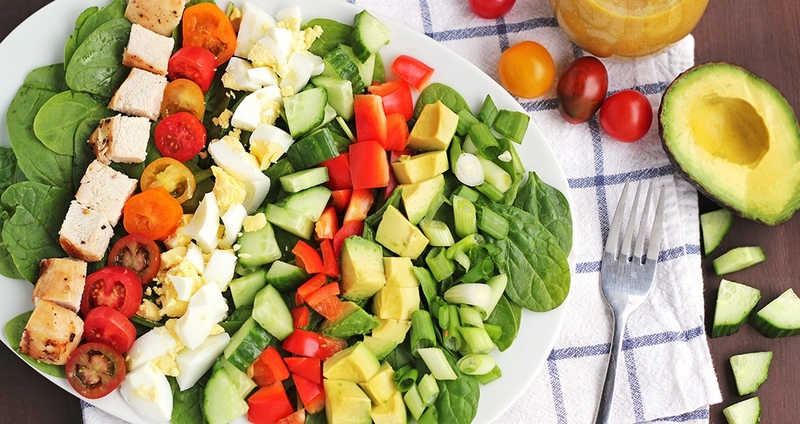 This lightened-up Cobb salad is a healthier take on the classic. Instead of blue cheese, bacon and a heavy dressing, this version is loaded with fresh vegetables to fill you up and leave you feeling energized! For a vegetarian version, simply omit the chicken and substitute with legumes or a plant-based protein of choice. Brush chicken with safflower oil and season with salt and pepper. Grill the chicken on both sides until done, about 5–7 minutes per side, or until the internal temperature reaches 165 degrees F. Let sit for 5 minutes, then cut into cubes. While chicken is cooking, add eggs to a medium-sized pot and cover with water. Bring water to a boil, then remove from heat and allow eggs to sit for 10 minutes. Carefully remove eggs and transfer into a bowl of ice water. Let sit for 5 minutes, then peel and chop. Divide the spinach between four bowls or plates. Evenly arrange the tomatoes, cucumber, avocado, bell peppers, scallions, chicken and eggs. Mix the ingredients for the dressing and then drizzle over the salads. Serve immediately.